Ayatul kursi is the most important ayah of Quran. Hazrat ali (R.A) said ”Ayat ul kursi is the Chief of ayats of Quran” which shows the importance of Ayatul kursi. Ayatul kusri has designed with 100% accuracy and delivered after full proof reading without any mistake. Ayatul kursi in English translation is an authentic English translation which is acceptable for all Muslims scholars. Recitation with a very beautiful voice is included and you may listen Ayatul kursi mp3 with English translation and Arabic audio. Ayatul kursi witrh English translation is a complete package with all the necessary needs to recite (Ayatul Kursi ki tilawat) , to listen(Ayatul kursi mp3), to read Urdu translation (tarjuma), to know about the blessings (Ayatul Kursi ki Fazeelat) and a lot more. It is necessary for Muslims to obey the rules which are told in Quran because it’s for our benefits. Ayatul kursi is an example which helps us in our daily life and will help us in the later life. It makes stronger our hearts and gives satisfaction and looks like that we are companioned by Allah. 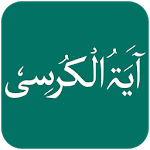 To get the complete understanding of Ayatul kursi English Translation is the main purpose of this app. You can read ayat by ayat Ayatul kursi english translation which is compiled very carefully and with great expertise to make it easy to read and use whenever you need it. 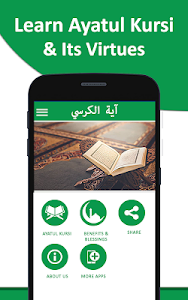 Ayatul kursi mp3 is sync with the verses of Ayatul kursi with english translation, which facilitate you to read and listen without touching and scroll or button. Ayats with english tarjuma will scroll by itself according to ayatul Kursi audio because of synchronization. This is the beautiful aspect of Ayatul kursi english that verses move on with recitation audio. Just start the ayat and listen with reading Urdu Tarjuma. You can also stop voice and start reading at any place of Ayatul kursi. Benefits of Ayatul kursi tilawat are also available for you to get aware of the importance of this Ayat as this is very important ayat of Quran. Some asked from Hazrat Muhammad (S.A.W) that which ayats is the loftiest of Quran and Prophet Muhammad (S.A.W) said “Ayat ul Kursi”. Ayatul kursi can be read in any difficult situation and as it’s our belief that Allah will help us so read memorize the Ayatul kursi and to understand the loftiness you need to learn the Urdu tarjuma of Ayatul kursi. 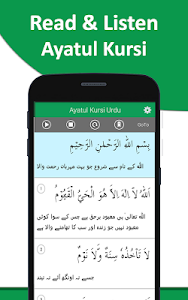 We always believe in providing of user valued apps like Ayatul kursi with Urdu tarjuma and audio which facilitate user with all the needed and essential features, therefore if you like our efforts then share Ayatu kursi Urdu with your friends and family. Similar to "Ayatul Kursi with UrduTranslation"